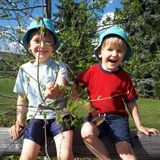 Looking for Full Time Live-out Nanny for two great kids! Want to be hired by Emma? We are looking for a full time Nanny to care for our two boys, aged 4 and 6. Our kids are sweet and good-natured little guys, who love to play outside, read, play lego, draw and paint, play board games, do puzzles, and engage in creative play of all kinds. We are looking for full time care in our home, 7:45am-4pm, five days a week. We want someone who is fun and playful, eats healthy, reads a lot, and loves to be outside. Our kids are both kind and generous, and respond best to someone who is patient and creative. We live close to lots of parks, splash pads, the ravine, bike paths, and libraries, so there is always lots to do. We are looking for a full-time employee nanny who will grow with us. We are not able to accommodate LMIA at this time. Our oldest is starting grade one in the fall at a school a few blocks from our house. We will need you to drop him off and pick him up from school every day. Our younger son is in preschool three mornings a week, so we are hoping you can help us keep our household running by helping with cleaning, laundry, and some light meal preparation while they are both out of the house. We are looking for someone to start immediately. We are happy to put you in touch with past caregivers so you can get a sense of our family and routine. We also have a cat and a fish, but neither of them require any care!